This week we learned that Special Counsel Robert Mueller subpoenaed data on accounts at Deutsche Bank held by Trump and his family. Most of the reporting on this simply noted that the German bank has been a major lender to the president. But there is a lot more to it than that. The first thing to keep in mind is that, as reported, Deutsche Bank was willing to lend Trump money when most U.S. banks wouldn’t due of a string of bankruptcies at his hotels and casinos. Because of that, they are his largest lender. 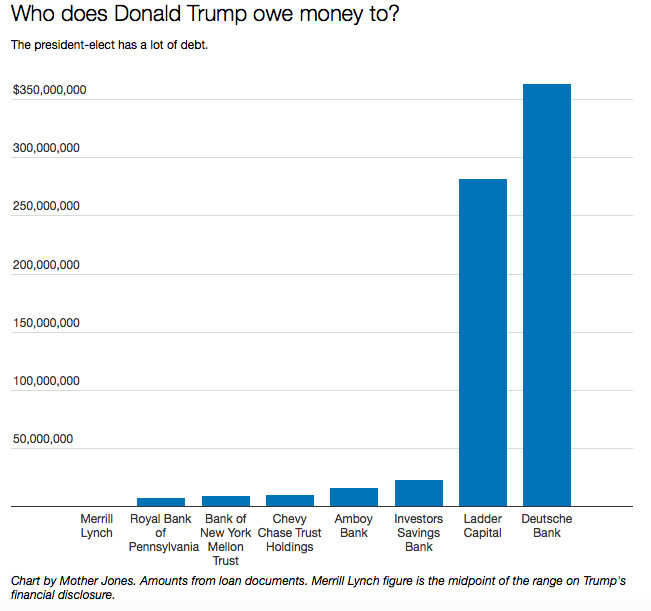 According to financial disclosures made by Trump during the campaign, he owes more than $714 million to several banks. But his biggest lender—by far—is Deutsche Bank, which has provided Trump at least $364 million in financing. The bank to which Trump owes all of that money has been under investigation for their role in a $10 billion money laundering scheme of Russian oligarchs. While New York state regulators settled this case, the DOJ investigation has gone quiet since Jeff Sessions became the attorney general and Preet Bharara was fired as the U.S. Attorney for the Southern District of New York. Deputy Attorney General Rod Rosenstein had an explanation that has implications far beyond this case. Under the Obama administration, financial institutions paid hundreds of billions of dollars in fines in the decade since the 2008 financial crisis. The DOJ had reversed decades of tradition by requiring banks to plead guilty to criminal charges ranging from market manipulation to sanctions violations. In September, Deputy Attorney General Rod Rosenstein said during a question-and-answer session after a speech at the Heritage Foundation that DOJ is reviewing its stance toward corporate prosecutions. In addition to the president’s involvement with Deutsche Bank, his son-in-law’s records might be of interest to Mueller. The loan came at a critical moment. Kushner was playing a key role in the presidential campaign of his father-in-law, Donald Trump. The lender, Deutsche Bank, was negotiating to settle a federal mortgage fraud case and charges from New York state regulators that it aided a possible Russian money-laundering scheme. As with so many of Kushner’s suspicious activities, this one was not mentioned on his financial disclosure form filed with the Office of Government Ethics. It is also worth noting the connection between Deutsche Bank and Vnesheconobank, or VEB, a Russian owned state bank that is under U.S. sanctions. The two banks signed a cooperation agreement in 2006, “with a view to further intensifying the cooperation between the two institutions.” The agreement was signed by VEB chairman Vladimir Dmitriev. Dmitriev left VEB in February 2016 and was replaced by Sergey Gorkov, a crony of Russian President Vladimir Putin and one-time member of Russia’s federal security service. Last December, the Russian ambassador arranged a meeting between Jared Kushner and Sergey Gorkov. Perhaps you can see why Trump threatened to fire Mueller if he started looking into his financial history at about the time that Deutsche Bank came up as part of the investigation. If there was a financial quid pro quo between Trump and Putin, it very likely ran right through the German bank.